Tip #1: Don’t Drive! Sounds simple doesn’t it. But I will place a Goldfinger Guarantee that if you don’t drive your car when it’s snowy outside, that you won’t get into a car accident! Not many lawyers can make guarantees, but I feel 100% confident making such a guarantee. I know it sounds silly, and very obvious, but to many, it’s not. You wouldn’t believe the amount of people who feel over confident driving on the roads when conditions are bad because they have the ultimate driving machine equipped with the best and most expensive snow tires money can buy. No amount of money, driving savvy or experience will save you from another driver losing control of his/her car and hitting your car due to the weather conditions. Especially when visibility is poor and road conditions are bad, your reaction time and ability to avoid an out of control car are compromised. Did I mention that traffic will be bad when it snows and the time to travel from A to B will take forever? Did I also mention that some roads might be closed on account of other car accidents not involving you? So, staying at home and waiting until road conditions improve doesn’t sound as bad as it may seem. 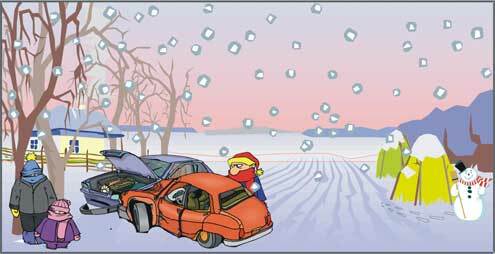 Tip #2: Don’t drive a rear wheel car, especially one without snow tires in a bad snow storm! . My father used to have a rear wheel drive Ford Mustang. My first car was a 1990 Mercury Cougar. Both cars were really cool, really powerful, both rear wheel drive and both TERRIBLE IN THE SNOW!!!. Even with snow tires, I can’t being to tell you how many times these cars would spin out of control trying to plow through the snow (even at slow speeds!). Rear wheel drive cars will have a greater likelihood of not getting up that hill in a snow storm, or just spinning out of control. When that happens, you’re compromising your safety, that of your passengers, and that of fellow motorists. Better off staying at home and not rolling the dice on getting into a winter weather car accident in the first place. Tip #3 If your really need to drive, do so in an All-Wheel Drive Car with Snow Tires. The Subaru Motor Company is world renowned for the All Wheel Drive/4 Wheel Drive cars. If anybody from Subaru is reading, this, feel free to send me a free car for the free plug, or a voucher to significantly reduce the purchase price for a Subaru car. So, if you really need to leave the house during a blizzard for an emergency, like going to the hospital, and you have the option of driving a rear wheel drive Camaro with run flat snow tires or an All Wheel Drive SUV, go with the SUV. Seems obvious, but you’d be surprised how many people opt for style over substance. Sometimes looking cool./classy on the hospital is more important than simply getting there at all, or getting there safe (like not in the back of an ambulance). Tip #4 Take the Subway if you can One of the nice things about the TTC, is that many parts of it run underground and are unaffected by the snow. I realize this option is not for everyone, but if you happen to live in the City of Toronto, and you’re near a subway line, take full advantage of it during a blizzard. That’s not to say that subway service will be perfect, but it will be better than waiting in a 400 car pile up on Highway 401. Please note that because I have recommended taking the subway, doesn’t mean that I’m recommending taking another form of transit like a bus, taxi or streetcar. Just because buses, taxis and streetcars are forms of public transportation, doesn’t mean that they’re immune to the weather and the hazards which the weather will present. A bus is just as likely to get into a car accident or get stuck in traffic or the snow as a car. Buses and streetcars aren’t invincible, they’re just really really big compared to a Honda Civic. Bus vs. Civic in a car accident: Bus wins every time. Trust me, you don’t want to be in that Civic no matter how slow that bus is traveling. Tip #5 If you must drive, be alert and be an interactive driver Be alert and being an interactive driver requires that you pay attention and do your best to interact with other drivers on the road. Use your horn, use hand signals, make eye contact with your fellow driver to make sure that everyone is on the same page. Honking your horn doesn’t have to be rude. I can be an alert to your fellow drivers of a dangerous move, or a dangerous driving condition. If can be notice that you’re coming through if your fellow driver can’t see you on account of poor weather. Tip #6 SLOW DOWN Torontonians are notorious for rushing everything they do, and driving is no exception. Driving in the snow isn’t the time to hurry or rush. You will get to your destination eventually. The people on the other end will understand if your’re late. It goes with the territory when living in Ontario. Other tips/ideas which should be considered are walking to your destination if it’s within walking distance, TELECONFERENCING or SKYPE are great if you have a meeting, or re-schedule your appointment or meeting are great ideas as well. Safety first is always a good way to go. The sun will come out tomorrow. It’s not just you who’s experiencing difficulties driving with the weather, it’s everyone. I also encourage drivers to pack a winter weather emergency kit which would include, but is not limited to a blanket, a road flare, a pylon, matches, a candle, dark chocolate (tasty and good for your energy), a shovel, appropriate winter clothing, have a cell phone on the ready to call 911 in case of emergency. Before cars provided Canadians with the luxury of interior heating, the Voyageurs used dogs to sleigh them along the frozen ice. Those Voyageurs were well prepared with all the necessary winter gear for their safety in ready for emergency because stuff happens on the road. Be cautious, be prepared. Staying at home where it’s safe is never bad option. And if you and your children decide to go tobogganing, make sure that you wear a helmet!